Angela Young‘s new novel The Dance of Love is historical fiction set at the turn of the twentieth century between 1899 and 1919. It is outstanding and I loved it so much. At times as I read it I could hardly see the pages through my tears – and there have not been many books that have that effect on me. It’s a brilliant book, both a heart-rending love story and a dramatic story too, as the sinking of the Titanic in 1912 and the devastating and tragic effects of the First World War impact on the characters’ lives. It’s the story of Natalie, the daughter of Sir Thomas Edwardes, a wealthy business man, a self-made man who is socially unsure of himself, but who wants his daughter to be accepted into society. It begins in 1899, a period when young ladies were presented at Court for the London Season, an opportunity to meet their future husbands. Natalie’s friends, the daughters of Lady Bridewell, are looking forward to the London Season. But Natalie has little desire to be presented at Court, relishing the idea that she would be free to live without such restraints and marry for love, someone who will care for her for herself, not because of her family connections. However, she falls in with her father’s wishes and when she meets a handsome artist-soldier, Lieutenant Haffie, it seems her wish for a happy marriage will come true. What I really liked about this book is the way historical background is seamlessly interwoven with the narrative and how it captures the changes in society as the years went by. Natalie grows from a young, impulsive teenager with passion for romance and dancing into a responsible young woman whose hopes for a happy marriage are in the balance. The portrait of the Edwardian upper classes, with their lavish life style, glittering balls and all their extravagances is fascinating, contrasting with the enormous changes in society as the War takes its effect. I liked all the details about paintings as Haffie shows his work to Natalie – Angela Young’s beautiful descriptions draw such vivid full colour images that I could easily visualise the paintings, which Natalie says are ‘mysteries made of light.’ And her portrayal of the settings, whether in London, Devon or the Scottish Highlands are just as vivid, making this a richly descriptive book. But it is the effect of the War and the effect on the families of those people travelling across the Atlantic on the Titanic that really brought home to me the whole human tragedy that people lived through, much more than any historical account has done. I think it’s seeing these events through the eyes of the people left at home that has the most impact. 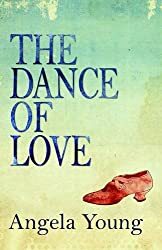 I had enjoyed Angela Young’s first novel, Speaking of Love and so was pleased to accept her offer of an uncorrected proof copy of The Dance of Love. I’m so glad I did as it’s a beautifully written, brilliant book that moved me deeply, and one I shall most definitely re-read (always proof of a good book for me). The Dance of Love will be published on 31 July 2014. Simon Thomas liked this on Facebook. Margaret – I sometimes think that societal changes and historical events such as the Titanic sinking are best told through the eyes of the individuals affected by them. This sounds like a novel that does that brilliantly, and I’m glad you enjoyed it. Another great review. I’ve never heard of this author, but your review really makes me want to get the book as soon as it’s released. Thanks, as otherwise I may never have came across it. Annabel Gaskell liked this on Facebook. Terrific review, Margaret. One to look out for definitely. Sounds wonderful, I shall have to see about it. Victoria Best liked this on Facebook. I love books that weave the history and fiction together well, so that caught my interest straight away. This sounds a wonderful book. Thank you so much for this gorgeous review, Margaret. I shall treasure it.